Pioneers in the industry, we offer laser scored pouches, organic tea laser scored pouches, dry fruit & nuts packaging and laser scored coffee bags from India. Today’s consumer food products market is flooded with many competitors. Customers purchase decision is based on presentation of good quality packaging and most preferably conveniences of the packaging. We are introducing laser optimized packaging to make life easier. Laser is the new technology for smart packaging with added values. Laser scored pouches are very easy to open specially for growing elderly population and arthritis patients. Pouches with laser can be used in packaging like Pet food, or tea, coffee, organic foods, protein powders, bakery, spices, fertilizers, medical products, pharmaceutical products etc. Laser scored pouches opens in straight line avoiding damage of zippers and after opening, the pouch looks more clean due to precise opening. Start using laser scored / scribbled pouches and watch your sales go high. Order samples from us today and try opening pouches with and without laser scored and feel the difference. 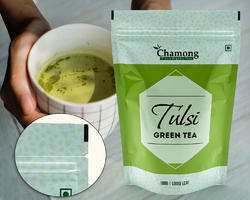 We are offering Organic Tea Laser Scored Pouches to our clients. 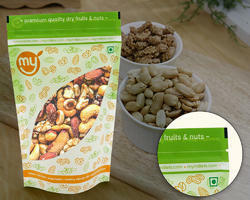 We are offering Dry Fruit & Nuts Packaging to our clients. We are offering Laser Scored Coffee Bags to our clients.